The SL1188 Ultrasonic clamp on flow meters is a state-of-the-art universal transit-time flowmeter designed using SLSI technology and low voltage broadband pulse transmission. While principally designed for clean liquid applications, the instrument is tolerant of liquids with small amounts of air bubbles or suspended solids found in most industrial environments. 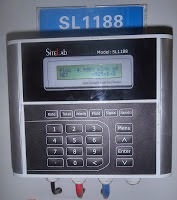 The SiteLab SL1188 Flow meters is a state-of-the-art universal transit-time Flow Meter for Heavy Industrial applications. Sophisticated electronics incorporating the latest developments in digital signal processing coupled with powerful ultrasonic transducers deliver highly accurate flow measurement for liquids in full pipes. While principally designed for clean liquid applications, the instrument is tolerant of liquids with a small quantity of air bubbles or suspended solids common in most industrial applications. The SL1188 ultrasonic clamp on flow meters offers low power consumption, high reliability, and outstanding applicability at an economical price. An easy to read display and clear, user-friendly menu selections make using the instrument simple and convenient. The instrument can be configured via keypad without any additional programming devices, is packaged in a die cast IP65 housing, and is available in your choice of non-invasive clamp-on or insertion transducer configurations. The SL1188 ultrasonic flow meters features a self-contained 4-20 mA current loop signal output for instantaneous flow, as well as two independent temperature inputs for thermal energy monitoring. The instrument also features a 7 digit alpha- numeric display, parallel operation of positive, negative and net flow totalizers (with user-selectable scale factors) and configurable pulse and frequency outputs (transmitted via relay and open collector) for totalized flow. As standard it incorporates a 1G SD Card for data logging and is supplied with the software to download stored data to your PC. Wetted Sensors available for acoustically dead pipes. 1G SD card high memory data logging, maximum memorize 512 days data. Simple Menu driven setup with a wide range of common pipe materials, liners and fluids selectable. Temperature inputs for energy measurement. The SL1 188E ultrasonic flow meter can be used to measure flow and provide water quality data acquisition at the same time. Data for flow, pressure, turbidity , residual chlorine and pH can be collected at the same time. The system is simple, reliable and convenient to use. Use GPRS wireless communications for wide coverage and reliable communications. There is no need to install outdoor antennas which greatly shortens project install ation and startup time and reduces total project cost greatly . The SiteLab Ultrasonic flow meter can be installed out side of the pipe with clamp on transducers or hot-tapped in to the pipe using wetted insertion transducers under pressure without flow interruption, making it very convenient to do network changes. Work stations can use SC1000 data acquisition software to extend the data acquisition function. Powerful open data base scan be used to provide other software data, such as: ODBC, DDE, OPC, Active X, etc. Powerful reporting functions can be generated on demand to generate daily reports, weekly report s, monthly reports, etc. If going to place a sl1188 ultrasonic flow meters in an explosive atmosphere (hazardous area), the ultrasonic flow meter’s explosion proof enclosure should be installed in a positively vented area. Before connecting the power supply, the user should create positive ventilation more than 5 times the enclosure volume for air exchange. The user must install the ultrasonic flow meters wiring in a safe area that would not cause sparking or arcing due to short circuiting or wire breakage. Cables and wires should be installed through explosion-proof conduit. Explosion-proof threaded conduit unions should be used between the wired conduits, conduits and junction boxes. The available thread. engagement into the fitting should be more than 5-6 threads. When flexible connections are needed, ex-proof flexible cable conduits can be used. - Choose a section of pipe that is always full of liquid, such as a vertical pipe with flow in the upward direction or a full horizontal pipe. - Ensure enough straight pipe length at least equal to the figure shown below for the upstream and down stream transducers installation. Clamp-on Ultrasonic Flow meters are installed simply by applying coupling compound on the bottom of the transducers and strapping them to the outside of the pipe. SiteLab Clamp on Ultrasonic Flow meters are internationally known for their simple and convenient installation and low maintenance characteristics. V method installation on pipe size :1” to16”(25mmto 400mm.